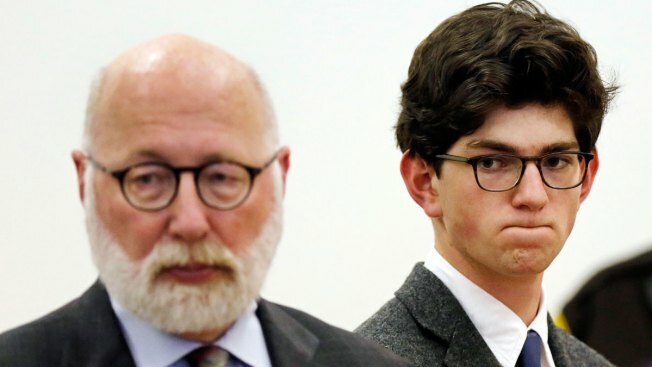 Owen Labrie, right, listens to prosecutors before being sentenced in Merrimack County Superior Court, Oct. 29, 2015, in Concord, N.H.
A letter in support of the New Hampshire prep school graduate who was convicted of sexually assaulting a younger student compares the conviction to the story of Joan of Arc. According to the Boston Globe, the letter was included in court filings for Owen Labrie’s appeal of his bail revocation. Labrie, 20, of Tunbridge, Vermont, was convicted of sexual assaulting a 15-year-old classmate at St. Paul's School in Concord, New Hampshire, when he was 18 years old. The letter did not identify the professor or the institution, but it says Labrie needed to travel to Boston for his studies. Labrie admitted to violating his 8 a.m. to 5 p.m. curfew three times to get to Boston early in the morning and was sentenced to jail. Labrie remained free while his lawyers appealed his conviction, but was given a curfew. The professor told Labrie that his conviction and hardships were a gift from God.